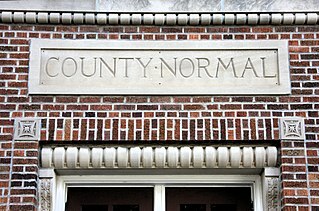 A normal school is the historical term for an institution created to train high school graduates to be teachers by educating them in the norms of pedagogy and curriculum. 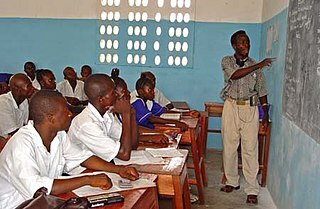 Most such schools, where they still exist, are now denominated "teacher-training colleges" or "teachers' colleges" and may be organized as part of a comprehensive university. Normal schools in the United States and Canada trained teachers for primary schools, while in continental Europe, the equivalent colleges educated teachers for primary, secondary and tertiary schools. A variety of movements of feminist ideology have developed over the years. They vary in goals, strategies, and affiliations. They often overlap, and some feminists identify themselves with several branches of feminist thought. María de la Concepción Jesusa Basilisa Rodríguez-Espina y García-Tagle, short form Concha Espina, was a Spanish writer. She was nominated for a Nobel prize in literature twenty five times in nine years. Delia Weber was an Afro-Dominican teacher, artist, poet and film actress, as well as a feminist and supporter of women's suffrage. Through her writing and painting, she portrayed the world in which she lived and the restrictions placed upon her life. Founding several cultural and feminist clubs, Weber successfully navigated the Trujillo years, helping to gain both civil and political rights for women. Minerva Bernardino was a diplomat from the Dominican Republic who promoted women's rights internationally, and is best known as one of the four women to sign the original charter of the United Nations. Rafael Leónidas Trujillo Molina, nicknamed El Jefe, was a Dominican politician, soldier and dictator, who ruled the Dominican Republic from February 1930 until his assassination in May 1961. He served as president from 1930 to 1938 and again from 1942 to 1952, ruling for the rest of the time as an unelected military strongman under figurehead presidents. His 31 years in power, to Dominicans known as the Trujillo Era, are considered one of the bloodiest eras ever in the Americas, as well as a time of a personality cult, when monuments to Trujillo were in abundance. Trujillo and his regime were responsible for many deaths, including between 20,000 and 30,000 Haitians in the infamous Parsley massacre. 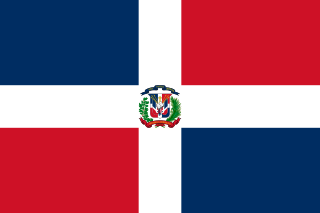 The Dominican Republic has gone through 39 constitutions, more than any other country, since its independence in 1844. This statistic is a somewhat deceiving indicator of political stability, however, because of the Dominican practice of promulgating a new constitution whenever an amendment was ratified. Although technically different from each other in some particular provisions, most new constitutions contained in reality only minor modifications of those previously in effect. Sweeping constitutional innovations were actually relatively rare. Women in the Dominican Republic have equal constitutional rights as men in the economic, political, cultural and social fields, as well as in the family. Their character has been defined by their history, culture, tradition and experience. The Dominican peso is the currency of the Dominican Republic. Its symbol is "$", with "RD$" used when distinction from other pesos is required; its ISO 4217 code is "DOP". Each peso is divided into 100 centavos ("cents"), for which the ¢ symbol is used. It is the only currency that is legal tender in the Dominican Republic for all monetary transactions, whether public or private. Aída Cartagena Portalatín was a Dominican poet, fiction writer, and essayist who wrote in Spanish. Some of her work has been translated into English and other languages. Corporación Estatal de Radio y Televisión is a radio and television network operating from Santo Domingo in the Dominican Republic. It is a public television channel operated and owned by the Dominican government. Following the frequency unification of 1996, CERTV has been aired throughout the country on channel 4. Previously, channel 4 was broadcast in Santo Domingo and the Southern zone, channel 5 in the Northern region and channel 12 in the Southwest. Manuel de Jesús María Ulpiano Troncoso de la Concha was an intellectual and President of the Dominican Republic from 1940 until 1942, as a puppet of dictator Rafael Trujillo. Prior to ascending to the Presidency, he was Vice-President from 1938 to 1940. His term began upon the death of President Jacinto Peynado. He also served in 1911 during the reign of the Council of Secretaries. Juan Francisco Ordóñez is a guitarist from Santo Domingo, Dominican Republic. His music combines blues, rock, and jazz. Daisy Cocco De Filippis is the current president of Naugatuck Valley Community College (NVCC) in Waterbury, Connecticut. She is the author of works of fiction and non-fiction dealing with Dominican and Dominican-American women. White Dominicans are Dominicans of complete or predominant European descent. They represent 16.1% of the Dominican Republic's population, according to the last population census in which race was queried. The majority of white Dominicans are descendants from the first European settlers to arrive in Hispaniola and have ancestry of the Canary Islanders, Portuguese, mainland Spanish, and French settlers’ lineage who settled in the island during colonial times. Many others are also descendants from white Levantines, Italians, Dutchmen, Germans, Hungarians, Americans, and other nationalities who have migrated between the 19th and 20th centuries. Franklin Franco Pichardo was a Dominican historian, sociologist, faculty member and politician from the Dominican Republic. Alba María Antonia Cabral Cornero, known as Peggy, is a Dominican journalist, television host, politician and diplomat. Since 2013, she is co-president of the Dominican Revolutionary Party, and was vice-mayor of the National District (1998–2002). She is José Francisco Peña Gómez's widow. Manuel Alejandro Grullón Viñas is a businessman from the Dominican Republic. In April 2014, he was appointed the Chairman of Grupo Popular, a company whose subsidiaries include Banco Popular Dominicano, the largest private bank in the Dominican Republic. He has been president of the Banco Popular Dominicano since 1990. Forbes listed Grullón as one of the ten wealthiest men of the Dominican Republic. Andrea Evangelina Rodríguez Perozo was the first female medical school graduate in the Dominican Republic. She was born on November 10, 1879, in San Rafael de el Yuma, La Altagracia, in a poor family. Her mother, Felipa Perozo, was an illiterate peasant who was left pregnant by Ramón Rodríguez, a wealthy merchant of the area who was also an officer in the army of Pedro Santana. Her parents died when she was a child and her paternal grandmother took charge of her. In addition to Perozo's medical work, she was also an author and published her first book Granos de polen in 1915, and subsequently published some poems and articles in the magazine "Fémina." On her return from the French capital she published a second book, titled Le Guerisseur: Cuento Chino Bíblico Filosófico de Moral Social. Her biographer Antonio Zaglul also indicates that she prepared the manuscript of a novel titled Selene in honor of her adoptive daughter, but destroyed it in a fit of anger. Zaglul also states that she was seized for her opposition to the regime of Rafael Leónidas Trujillo and her strong criticism of the government, and that she was held in a fortress in San Pedro de Macoris and tortured. She was later abandoned on a road near the town of Hato Mayor. Yadira Henríquez is a Dominican attorney and politician who has worked in criminal law, international law, land law and women's rights throughout her career. Between 1994 and 2000 she served in the Chamber of Deputies as a representative for the Partido Revolucionario Dominicano (PRD) of the Dominican Republic. In 2000 she was appointed as Minister, serving as the Secretary of State for Women of Dominican Republic and in 2002, was elected as the president of the Inter-American Commission of Women, serving that body from 2003-2005. Martha Ellen Davis is an emeritus professor from the University of Florida, anthropologist and ethnomusicologist known for her multifarious work on African diasporic religion and music. Professor Davis' research has defied conventional tenets about Haitian and Dominican folk music, and her cultural preservation projects has raised awareness of the significance of the Samaná Americanos' enclave. José Gabriel García was a Dominican military, historian, politician, journalist and publisher. He is regarded as a cultural pioneer as well as the "Father of Dominican History". He is the author of "Compendium of History of Santo Domingo" written in four volumes in 1867, 1887, 1900 and 1906 respectively and made numerous contributions in the fields of culture, literature and education. Mercedes Laura Aguiar was an educator and feminist from the Dominican Republic. As a journalist and poet, she wrote works to promote equality of men and women and Dominican sovereignty, writing in opposition to the US occupation. As a feminist, she fought for the right to vote, the right of women to education, and employment protections for women and children. Isabel Mayer was a Dominican feminist, politician and socialite from the province of Monte Cristi in the Northwest of the Dominican Republic. She was a member of the feminist group Acción Feminista Dominicana (AFD) that helped secure suffrage for women in the Dominican Republic in 1942 under dictator Rafael Trujillo. She served as a senator from her home province from 1942-1944 and also as governor of both Monte Cristi and Santiago. A number of foreign journalists referred to her as a celestina, or madam, for Trujillo during the regime. Petronila Angélica Gómez was a teacher from the Dominican Republic, who established the first feminist organization and first feminist journal in the country, as a means to protest the United States occupation of her homeland. She developed networks with international feminist organizations and actively sought an increased role for women in society and eventually women's suffrage. Soon after women attained the vote, she lost her vision and retired from public activity, though she published two books after going blind. She is remembered as a pioneering feminist and has been recognized by a street and meeting hall which bear her name. ↑ "Abigail Mejía". republica-dominicana-live.com (in Spanish). República Dominica LIVE. Retrieved 20 November 2017. 1 2 3 4 5 6 7 8 9 10 11 12 13 14 15 16 Fernandez-Asenjo, Maria-Mercedes (2015-01-01). De maestras normalistas a 'damas trujillistas': El feminismo Dominicano, 1915-1946 (Thesis). ProQuest Dissertations Publishing. 1 2 3 4 5 Zeller, Neici (2010-01-01). The Appearance of All, the Reality of Nothing Politics and Gender in the Dominican Republic, 1880-1961 (Thesis). ProQuest Dissertations Publishing. 1 2 3 4 "Abigaíl Mejía: pionera del arte fotográfico con mirada de mujer". Acento (in Spanish). 2014-06-30. Retrieved 2017-04-28. 1 2 3 4 5 Manley, Elizabeth (2008-01-01). Poner un grano de arena: Gender and women's political participation under authoritarian rule in the Dominican Republic, 1928–1978 (Thesis). ProQuest Dissertations Publishing. ↑ Marivi, Arregui, (1988-03-01). "Trayectoria del feminismo en la República Dominicana". ↑ Candelario, Ginetta EB (2007). Black behind the Ears: Dominican Racial Identity from Museums to Beauty Shops. Durham: Duke University Press. ISBN 0822340372. ↑ "Sueña Pilarín | Las Mujeres más destacadas de República Dominicana". balanzalegal.com (in Spanish). Retrieved 2017-04-28.